Over 125 visiting craftsmen from around the country demonstrate their art, including Best of Missouri Hands juried artists, all joining Silver Dollar City's 100 demonstrating craftsmen. Silver Dollar City's Wild West Show features trick riders, Native American dance with 8-time World Champion Native American Hoop Dancer Nakotah LaRance, comedy canines, and trick roper and bullwhip artist A.J. Silver. Legendary Western actor and watercolor artist Buck Taylor hosts "Buck Taylor's Cowboy Emporium," featuring a variety of Western crafts. NEW: The nation's pioneer culinary heritage comes to life with campfire cooking and cowboy cuisine, including Cowboy Beef Stew and Dutch Oven Desserts. Festival history: Silver Dollar City began the fall crafts festival tradition in 1963, bringing in visiting craftsmen in addition to the park's growing resident crafts colony, with the goal of showcasing the makers along with the finished artwork. More than half a century later, a unique feature still is that all visiting crafters, as with the park's own, demonstrate their work so guests see the process, the skill and the creativity of true craftsmanship. This became the nation's largest festival of demonstrating craftsmen. The focus on authentic craftsmanship was one of the reasons the U.S. Congress in 2010 proclaimed Silver Dollar City the "Home of American Craftsmanship." 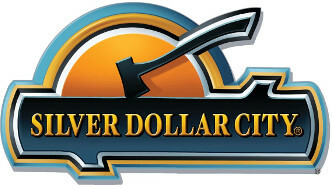 In addition to craftsmen, Silver Dollar City added features with another American icon several years ago, the cowboy, to carry on the festival as The National Crafts & Cowboy Festival. NEW: Christmas in Midtown, a 70,000 sq. ft. area filled with new light displays 9 stories high, including 30 angels, animated reindeer pulling a sleigh, 3 light tunnels, two 40-foot long moving trains, dozens of stars and snowflakes, and a 50-foot tree, all created at Silver Dollar City. Christmas in Midtown, the largest single lighting expansion to date in the past 2 decades of the festival, adds 1.5 million new lights, bringing the park's total to 6.5 million lights! Rudolph's Holly Jolly Christmas Light Parade, led by the most famous reindeer of all, features musical lighted floats with 200,000 lights accompanied by 33 costumed characters. Rudolph's Christmas Town, where kids can meet Rudolph, Clarice and Bumble, also includes activities from Reindeer Games to cookie decorating. Two original musical productions present Broadway-style experiences, with elaborate sets and talented casts: It's a Wonderful Life, adapted from the Frank Capra classic, and the acclaimed production A Dickens' Christmas Carol. Tinker Junior's Toy Shop is an interactive show for kids featuring a 12-foot talking and singing Christmas tree.